As described in Physical Review Letters, the JILA method makes spatial maps of energy shifts among the atoms in a three-dimensional strontium lattice atomic clock, providing information about each atom's location and energy level, or quantum state. The technique rapidly measures physical effects that are important to atomic clocks, thus improving the clock's precision, and it can add new atomic-level detail to studies of phenomena such as magnetism and superconductivity. In the future, the method may allow scientists to finally see new physics such as the connection between quantum physics and gravity. "This technique allows us to write a piece of beautiful 'music' with laser light and atoms, and then map that into a structure and freeze it like a stone so we can look at individual atoms listening to the different tones of the laser, read out directly as an image," JILA/NIST Fellow Jun Ye said. The atoms are in a so-called quantum degenerate gas, in which large numbers of atoms interact with each other. This "quantum many-body" phenomenon is extending measurement precision to new extremes. 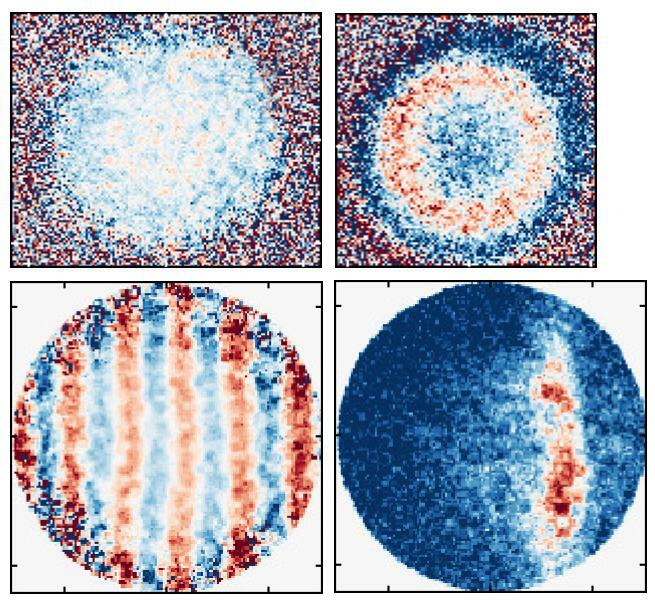 The resulting images are false-color representations of atoms in the ground state (blue) and excited state (red). The white region represents atoms in a fine mixture of about 50 percent red and 50 percent blue, creating a dappled effect. This occurs because these atoms were initially prepared in a quantum state of superposition, or both ground and excited states simultaneously, and the imaging measurement prompts a collapse into one of the two states, which creates "noise" in the image. "As the clock gets better in the next 20 years, this little crystal could not only map out how gravity affects frequency, but we could also start to see the interplay of gravity and quantum mechanics," Ye said. "This is a physical effect that no experimental probe has ever measured. This imaging technique could become a very important tool."